Just like there are different kinds of volcanic eruptions (picture Mt. St. Helens blasting its top, vs. Hawaii’s Kilauea oozing lava as tourists stand nearby) — there are different types of quakes. Many types. Too many, so let’s start with a basic division: Subduction zone quakes vs. crustal quakes. What you see in Japan is the result of a subduction quake. New Zealand suffered from a crustal quake. Subduction quakes are typically off-shore, and these are the most common sources of tsunamis. Crustal quakes can run directly under a city, such as Seattle or Los Angeles, and in the aftermath, you sometimes can see a big section of earth thrust six or eight feet up from the ground next to it. The region around Seattle gets both kinds. Readers: Any other suggestions for another Mini-Lesson about Earthquakes? Re. the subduction quake, much has been written by other news sources (not all of it accurate, some of it overly alarmist). I wrote this following piece for KPLU: ——————— You may have heard Washington has an earthquake fault similar to the one that devastated Japan. While there are many fault-lines criss-crossing western Washington, the only one that bears a strong similarity is under the ocean, parallel to our coast-line. It’s called the Cascadia subduction zone. Story starts on January 26, 1700 The Cascadia fault zone lies about 80 miles off-shore, where one of earth’s plates slides under another. It’s been silent for three centuries. 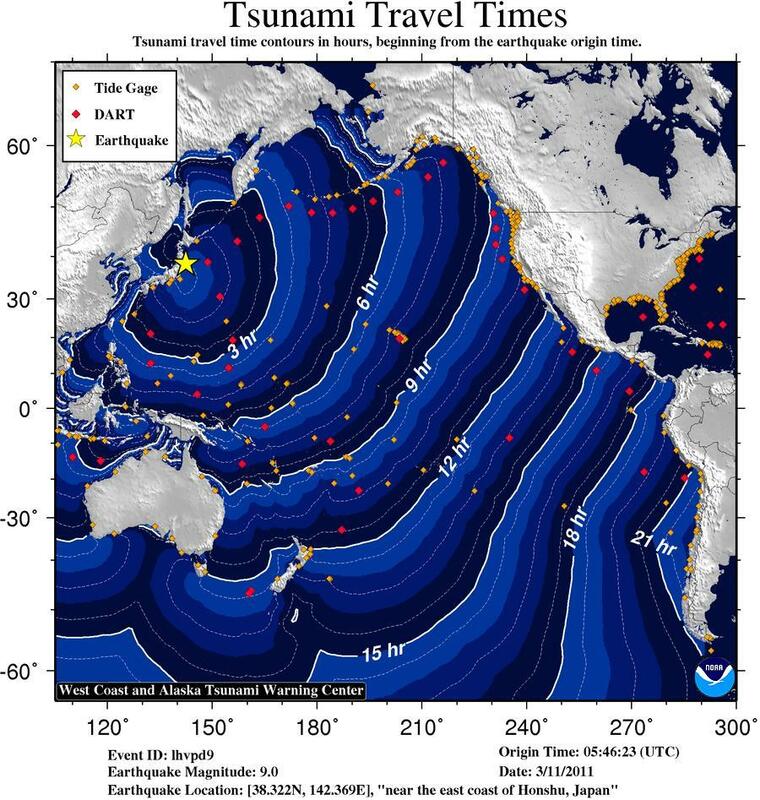 But, there’s strong evidence that in 1700 it let loose an earthquake slightly bigger than the one that hit Japan last week — sending a huge tsunami toward the Washington and Oregon coasts. “Earthquakes like this are reminders, and that they would happen in Japan where we have close ties, brings it all closer to home, somehow,” says Brian Atwater of the US Geological Survey and the University of Washington. The biggest new lesson so far from Japan is that debris – that means cars, busses, even houses – swept up in water moving 30 miles per hour can do more damage than anyone realized. Japan also has invested more than any other country in structures — such as evacuation towers, flood-gates on rivers, and sea-walls. It’s still too early to say which of those helped. It’s possible those defenses work for more common earthquakes. But, this quake was the fourth or fifth strongest ever recorded. In an email, one scientist in Japan says she heard the tsunami washed people off the roof of an office building that was more than 40-feet tall. How can you prepare for that? This entry was posted in earthquakes and tagged earthquake, Japan, tsunami by Admin. Bookmark the permalink. Until now, Japan’s tsunami still tears my heart apart…I never get tired reading articles and news about their progressive recovery…hopefully everything will be okay. I always admire when someone share informative articles or blogs. I read where Alaska just had a 7.0 earthquake…what kind was it?